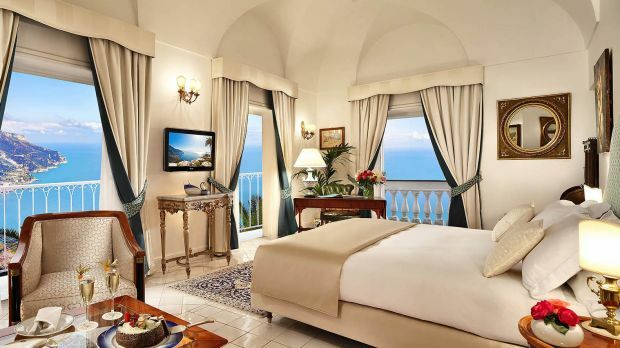 Craggy mountains draped in dark green, tumbling dramatically into the sea - the beauty of Italy's Amalfi coast is a perennial shock to even the most seasoned luxury traveler. Palazzo Sasso sits proudly 1,000 ft.
Nearly 1,000 years old, Palazzo Sasso has been restored time and again by architects and developers who couldn't help but be touched by its spectacular location, and driven to revive its crumbling walls. Despite its numerous overhauls, preservation has always been of paramount concern throughout the centuries, such that there are still a few rooms that date back to before the Renaissance, including the entrance way and the restaurant cellar. Up until 1978, Palazzo Sasso was the luxury resort of dignitaries, royalty, and artists. Walk in their footsteps while enjoying the restorations and improvements that have been added in the last 15 years. Not to be outdone by the natural beauty surrounding it, Palazzo Sasso offers its guests tranquil spa facilities and decadent cuisine. The spa, adjacent to the lap pool and gardens, as well as the two-Michelin-star restaurant, overlook the sparkling Mediterranean Sea and the steep mountains - so you never have to part from them. Send an availability request with your requested dates to the Palazzo Avino. This room has a high window with no view. Bathroom has Jacuzzi bath. These rooms are facing the mountain or the charming pedestrian street. All bathrooms feature either a Jacuzzi bath or walk-in shower. Features 1 King or 2 Twin beds, jacuzzi, bath or shower and luxury bath amenities menu. 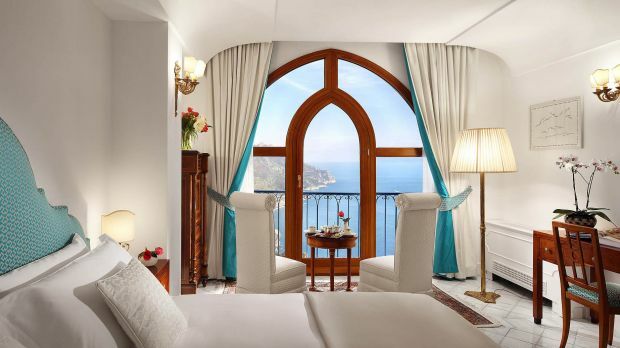 These rooms feature large windows with enchanting vistas of the Mediterranean Sea. All bathrooms have either Jacuzzi bath or Jacuzzi shower. Room with Twin or King bed, outside sitting area, bath and shower and balcony. Located on a high floor. These spacious accommodations are composed of a large bedroom with a sitting area, large bathroom with Jacuzzi bath, all overlooking the Mediterranean Sea. 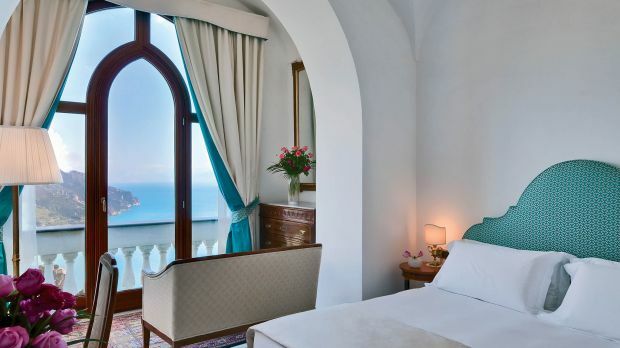 These suites are composed of a large bedroom with a sitting area, a balcony, large bathroom with Jacuzzi bath, antique furniture, high ceiling and views overlooking the Mediterranean Sea. Sophisticatedly appointed one bedroom suites with living rooms and large bathrooms with Jacuzzi baths, these accommodations have large terraces overlooking the brilliant blue Mediterranean Sea. This elegant one bedroom suite with living area includes a large bathroom with Jacuzzi bath. Four full windows overlook the Mediterranean Sea that features a balcony suitable for breakfast or dinner. Equipped with B&O Hi-Fi and plasma TV. It is the largest and most beautiful suite in the hotel. Situated on the top floor of the building, this bi-level suite is composed of one large living room including a dining area, one bedroom and one large bathroom with both a Jacuzzi bath and separate large shower. There is also an additional guest bathroom in the living room area. On the top floor there is a relaxing area that leads onto a very large private outdoor terrace with an amazing view over the Amalfi Coast. Ideal for romance, the terrace features a Jacuzzi hot tub and a large dining area - perfect for private dinners! This suite is equipped with plasma screen, Bose Hi-Fi in all areas. Situated at one of the garden levels of the hotel, this very private suite has a large living area with steps up to an open master bedroom. The living area features a Jacuzzi hot tub ‘center stage’ and is adjoined by a large outdoor terrace overlooking the Mediterranean Sea that is ideal for dining ‘al fresco’. This suite is equipped with a large walk-in closet and B&O Hi-Fi and TV.